Why is this the easiest red Thai curry? First, you can use whatever vegetables you have in your refrigerator -- you could even use a bag of frozen mixed vegetables if that's all you have on hand. Second, because once you get cooking you'll see how easy it is to cook an amazingly flavorful curry. This curry recipe never goes out of season because you can always mix and match your favorite seasonal vegetables. You'll notice that this wholesome recipe uses tofu, but it works just as great with chicken or even with shrimp. The one rule for this dish is that it's very important to have all of the ingredients ready to use as this curry comes together rather quickly. You'll want to also start cooking the steamed rice before you begin with the curry. It is important to note that if you are going to be cooking this curry for a vegan person, this will not conform to their diet. The reason for this is that most commercially made curry paste is prepared with shrimp paste. This recipe calls for fish sauce, as well. Heat a large pan, once hot add the coconut oil and allow it to get hot. Add the red onion and sauté until it begins to soften. Add the potatoes and cook for 5 minutes -- but keep stirring to prevent them from sticking to the pan. Add the carrots and the garlic and sauté for 3 minutes. Push the vegetables aside and add the curry paste, fish sauce, and soy sauce in the space cleared of the vegetables; next, add a little splash of coconut milk to help mix and combine these ingredients. Slowly keep adding more milk until you achieve a smooth sauce (you won't need to use all of the coconut milk yet). 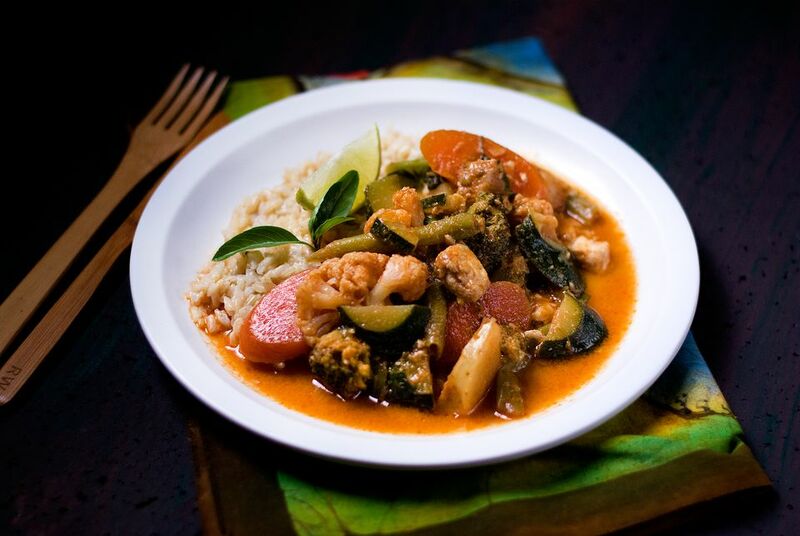 Carefully combine the sauce with the vegetables you had pushed aside, give it all a good stir. Now pour in the rest of the coconut milk, cover and simmer over medium-low heat for 10 minutes. While the curry is simmering, fry up the tofu. Heat a small pan then add a tablespoon of coconut oil to it. Once the oil is hot, carefully add the cubes of tofu to the pan. Add a splash of soy sauce and fish sauce to the tofu just to give it a bit of flavor. Continue to cook/fry the tofu until it begins to brown and all of the liquid has evaporated. Turn the heat off and set aside. Remove the lid from the simmering curry and carefully add the green beans, cauliflower and broccoli florets, and the zucchini bits. Gently give the ingredients a stir, cover and simmer until these vegetables have softened -- about 5 to 8 minutes. Taste the curry sauce and if needed add more fish sauce or soy sauce. Once the last batch of vegetables has become tender turn off the heat and add the lime juice and the fresh basil leaves. Give the ingredients a stir and you are ready to serve.